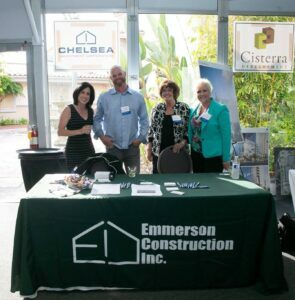 Last Thursday BIA members gathered under The Pavilion at the Hilton Mission Bay in record numbers for the largest networking event of the year. Associate members were able to meet and greet with representatives from 34 different builder/developer companies – including project managers, general superintendents, purchasing, land acquisitions, and sales and marketing. Our Partnership Program (P2) Sponsors even got access to the event one hour early to make connections in a more intimate setting. Check out all of the great photos from the event shot by BIA member, Yrsina Colangelo of YC Photography. We also have a great recap video of the event created by Brent Taylor from Taylor Trim & Supply. Thank you to our sponsors for helping to make this event happen: Eldorado Stone, Living Spaces, and Milgard Manufacturing. Another shout out to Motivational Systems, Inc. for donating the signage and Geotek for donating the bottled water. If you attended the event and want to tell us what you thought, click here to take our survey.